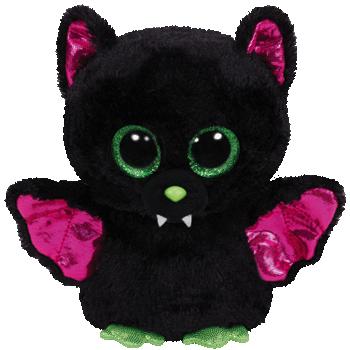 Igor is made from a fuzzy black material with a shiny pink material for his wings and the inside of his ears. He has large sparkly green and black button eyes and a bright green nose with tiny white fangs. His feet are glittery green. And then I fly all over town! Igor was introduced on 1st July 2015. His birthday is on 7th September. Igor is a Halloween themed Beanie Boo.